Over at Julie's: Magical Moments! On the back of our 3 acres we have quite a forest of desert broom that is just coming into bloom. 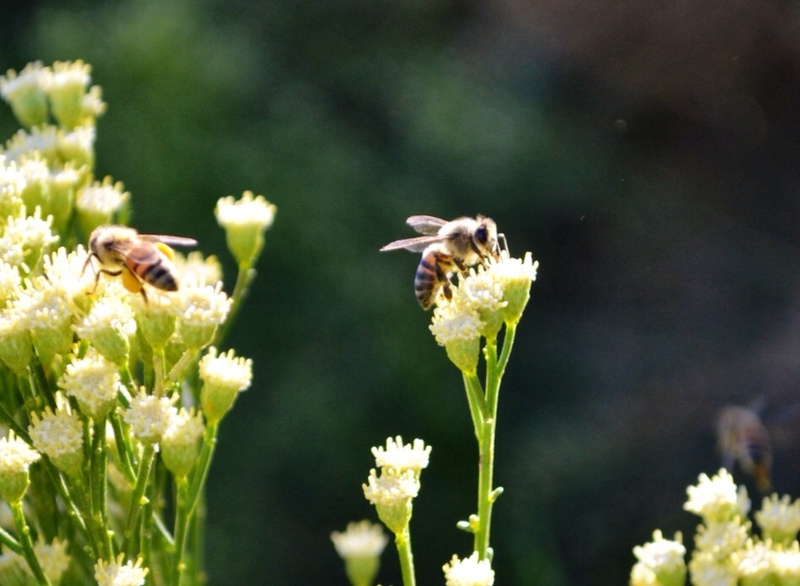 Our "little pollinators" love it! I spent a good hour out back clicking photos and enjoying all the buzzing bees and butterflies. It was quite beautiful! I'm still learning how to use my new DSLR camera . . . hope you enjoy these photos! 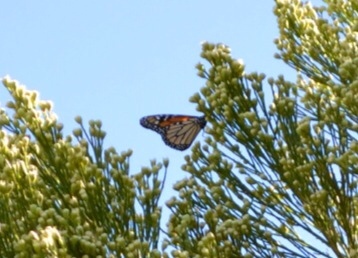 Monarch butterfly about 20 feet up, enjoying nectar! This "rear" shot shows me this is a young bee. Notice her pollen pouches stuffed with yellow pollen. She will probably have difficulty landing with such a full load! 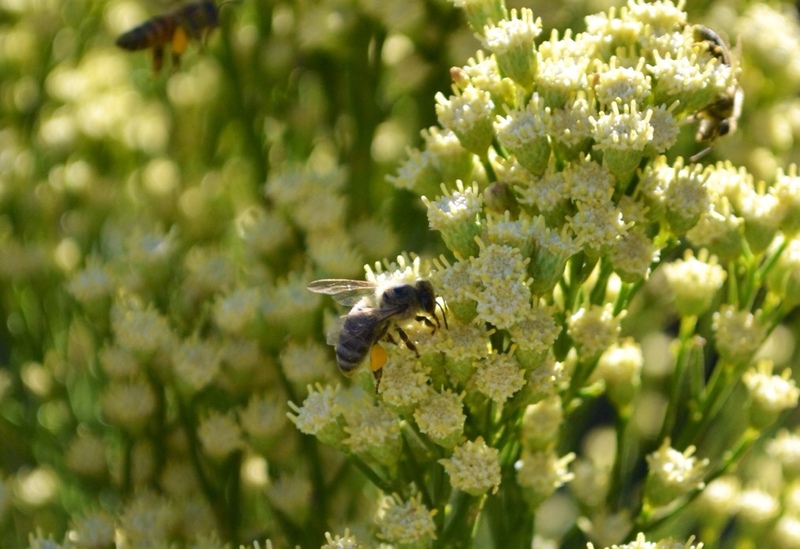 Bees collect yellow, white, green and brown pollen! 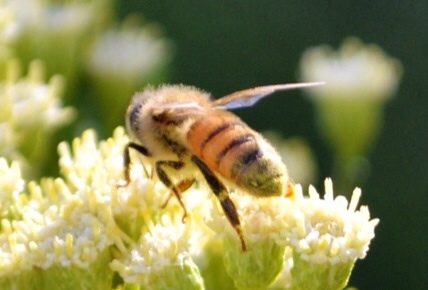 The honey bees in our front yard are collecting white pollen from all my massive basil plants. 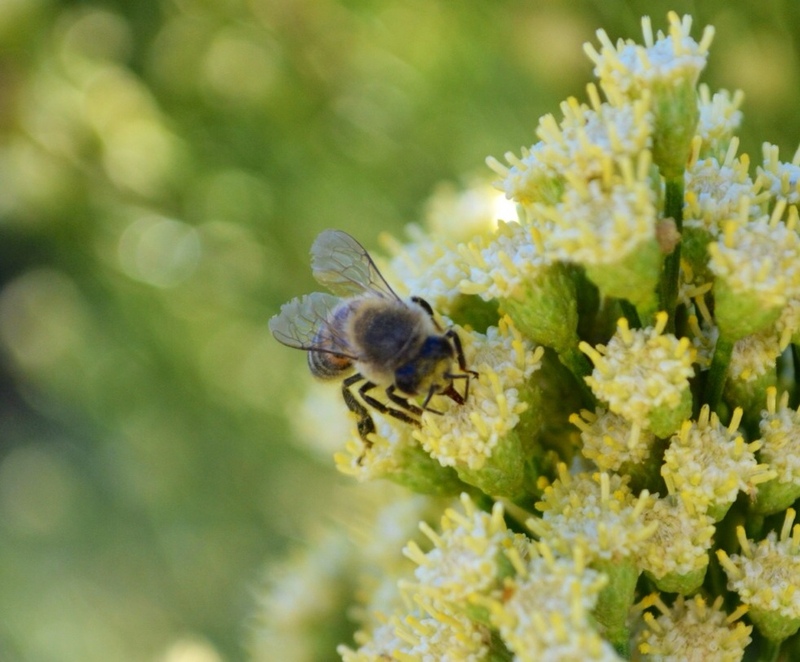 This fuzzy honey bee has just returned from dropping off pollen and nectar. See her pretty eyes! You can tell by her tattered wings this honey bee is approaching the end of her life cycle. I never took the time to actually see the beauty of these tiny desert broom flowers. They are quite beautiful en masse! Isn't she exquisite with her dark golden body and black stripes? 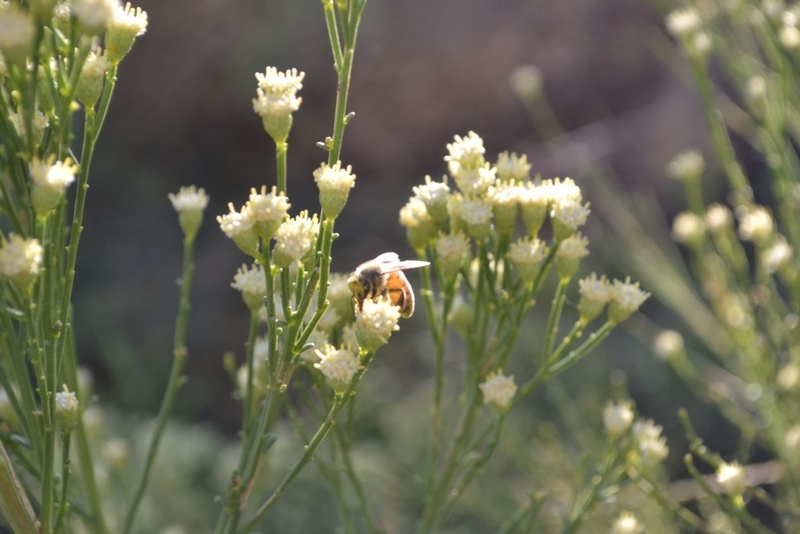 Being out there with thousands of honey bees, bumble bees, and butterflies was mesmerizing! 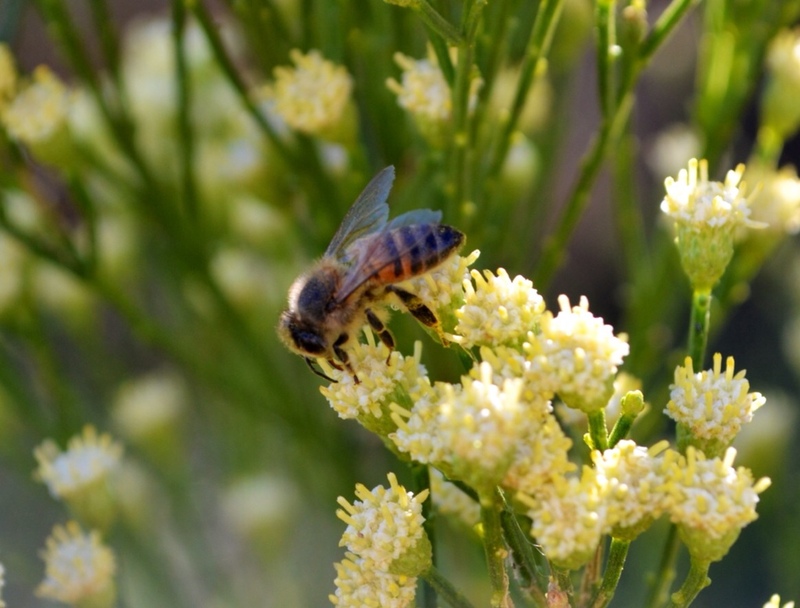 Bees collect yellow, white, green and brown pollen! 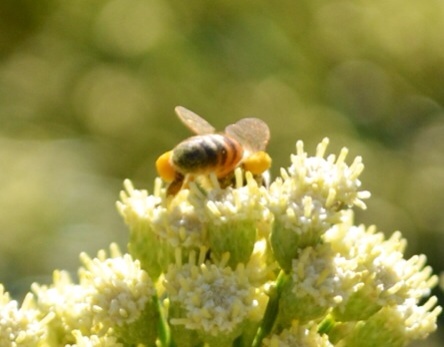 The honey bees in our front yard are collecting white pollen from my massive 5 foot-plus basil plants! Looking to the sky above the towering, flowering bushes, I could see a veritable highway of pollen and nectar gatherers eagerly arriving to load up on nectar and pollen. The bushes were alive with the fluttering wings of butterflies and buzz of bees. It's magical moments like this that make remember why I decided to become a beekeeper . . . Over at Julie's!! !